Do you know if your keyword research and optimization efforts are working? When you’re running a website that relies on revenue from search engine traffic, then being able to track specific keywords is critical. Sure, they’re only one part of the SEO puzzle, but it’s important to know how they’re performing. And for that, you need the right tools. What level of rank tracking can you monitor; e.g. down to city/local level rank tracking? What’s the frequency of rank tracking changes; e.g. daily, weekly? 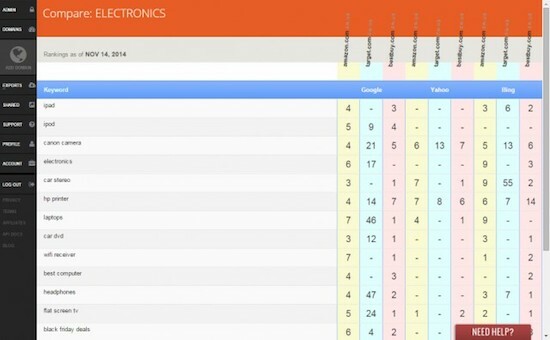 Can competitors can be tracked alongside your keyword rankings? What data and metrics can you see in the online dashboard? How well is the information presented? What email notifications/alerts do you get for tracked changes? Can you generate weekly/monthly reports? Is there a white label reporting option? And at the end there’s a comparison to see which tool is the best fit for you. The rank tracking tools below are all online services. Yes, there are desktop tools available, but in our experience, the online tools are easier to set up and share results with your team or clients. SERPWatcher is a rank tracking tool built with a focus on effectivity and ease of use. It’s easy to start tracking keyword rankings in SERPWatcher. For each valid domain you can choose to track at country, state or city level, plus you have the option to differentiate between desktop and mobile platforms. Keywords can be imported from KWFinder, an uploaded file, or copy and pasted. The SERPWatcher Dashboard contains all your essential rank tracking data in two convenient columns. On the left-hand side, you can see your tracked keywords, position changes, and search volumes. On the right-hand side of the dashboard are more metrics and charts. the Keyword Position Distribution with the count and percentage of keywords in six various position categories. SERPWatcher uses interactive online tracking reports rather than static PDF files. Anyone with the link has access to the tracked keywords list plus all the metrics and charts. And, because it’s interactive, they can adjust the timeframes for comparison. It also has some automatic reports and alerts that you can distribute via email. You can send a weekly report every Monday and a monthly report on the first day of every month. 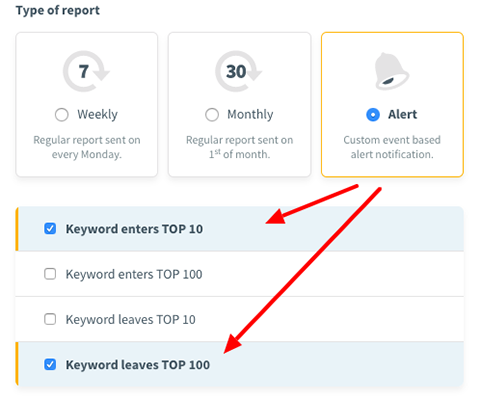 There’s also an option to configure a custom alert that’s triggered by an event; for example, Keyword enters Top 10 or Keyword leaves Top 100. The Mangools SEO suite includes three more tools that integrate with SERPWatcher. KWFinder is a popular keyword research tool with a user-friendly interface, and SERPChecker is a Google SERP analysis tool. And they also have a backlink tool called LinkMiner. There are three subscription plans, based on the volume of keywords. For SERPWatcher this ranges from 200 to 1500 tracked keywords with unlimited tracked domains and daily rank updates. 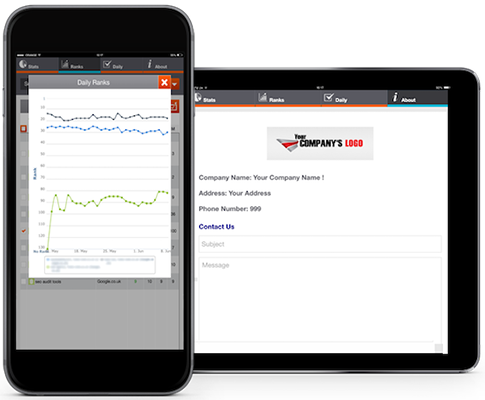 ProRankTracker is a rank tracking and reporting solution suitable for individuals, small businesses, and large enterprises. ProRankTracker claims to have the most accurate algorithm of any rank tracking tool giving you the most accurate results from the top 100 search positions. It tracks terms across a wide range of regional search engines – 187 Google sites, 35 Yahoo sites, and 32 Bing sites – so that you can track rankings by country and city. You have the option to track rankings on multiple platforms including Desktop, Mobile, Desktop and Mobile, YouTube, Amazon and Local Finder. 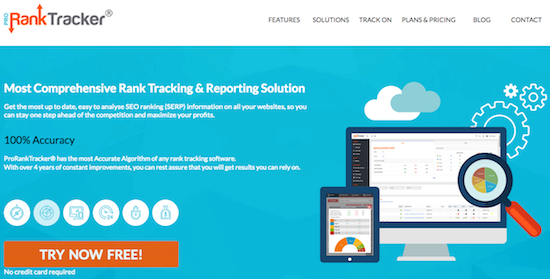 ProRankTracker automatically checks the ranking of your tracked terms (keywords) every day. Below that is the current ranking showing how many of these terms are in the Top Spot, Top 3, Top 10, Top 20, Top 100, plus the changes over the last 24 hours. ProRankTracker includes lots of advanced reports, including Overview Reports, Historical and Progress Reports, Comparison and Benchmark Reports. All of the reports are white label so you can customize them with your company logo and branding. You can send reports to your clients from any email address that you own, or you can choose to host and share them on a secure URL. An even better solution is the MyRanks mobile app for iOs and Android. Your clients can see their reports, branded with your details, whenever they want. There’s also the option to create scheduled automated reports that can be distributed via Email or saved to your Dropbox or Drive account. And finally, you can set up automated email notifications, triggered by your terms ranking changes. ProRankTracker offers a wide range of subscriptions plans available on a monthly, semi-annual or annual basis. Prices are based on the number Terms (One Term = 1 search term tracked for 1 URL on 1 search engine). For example, 300 Terms could be 6 URLs x 50 Search Terms or 3 URLs x 100 Search Terms. There’s also a 7 day free trial. AuthorityLabs provides accurate and reliable search engine ranking data, and is a popular tool amongst SEO professionals. 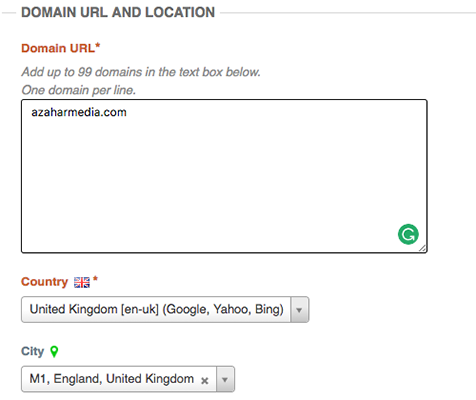 AuthorityLabs can track your chosen domains in every country and language offered by Google, Yahoo, and Bing. The small graphs to the right of each domain show the average rank for all tracked keywords in each domain as well as the average change in rank for that specific keyword set on each respective search engine. It also offers white label reporting so you can customize them with your branding for seamless client reporting. The Now Provided report, which combats the secured ‘not provided’ data from Google, is unique to AuthorityLabs. It combines data from various sources including rank tracking and Google Analytics to show you which keywords are driving traffic to each page on your site. 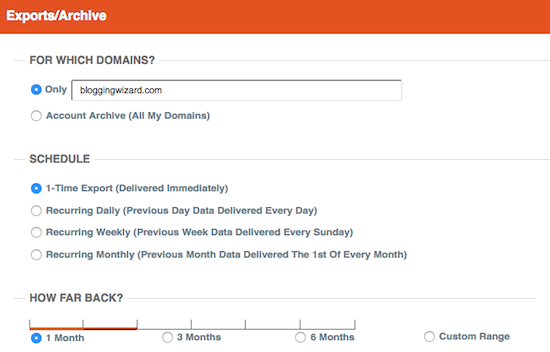 AuthorityLabs offers a range of prices based on the number of keywords and domains you want to track. If you’re not sure what you’ll need, you can start with a 30-day free trial and then upgrade or downgrade as required. SE Ranking is a complete SEO suite. Although it started as a keyword rank tracking platform, it now does a lot more including backlink monitoring, competitor research, keyword research, and on-page SEO audits. SERanking lets you track your keyword rankings on a country, region or city level as frequently as you wish. It monitors the real-time positions of your website’s keywords in the major search engines for your chosen language and countries. You also have the option of tracking mobile and desktop search results as well as Google Maps. In addition to your own websites, SE Ranking lets you monitor up to five of your competitors, too. 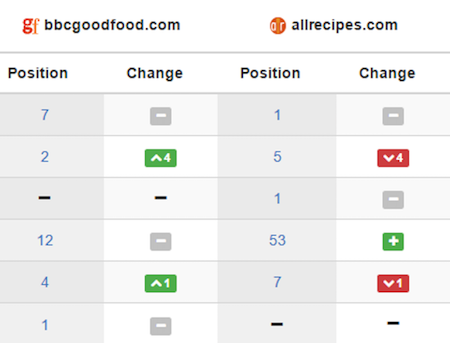 You can check their ranking positions against your target keywords and search engines. Alternatively, you can let the tool automatically discover and track your Top-10 competitors. 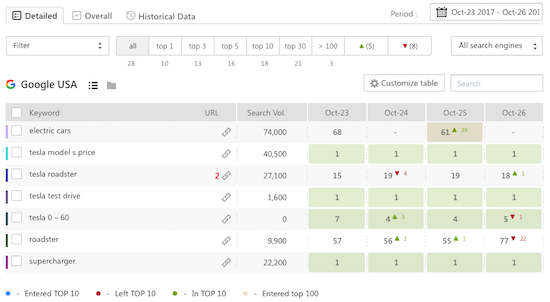 The dashboard in SE Ranking gives a clear view of your keyword rankings for each tracking combination you’ve created. For example, from the selection earlier there are dashboards for Google USA, Google UK, Google Mobile USA, and Bing USA (English). SE Ranking has fantastic white label reporting facilities. Using your custom logo and agency name, you can build your reports from 18 modules that include a cover page, ranking overview table, traffic goals, detailed competitors rankings, performance-based invoicing and more. You have the option to add extra comments to any part of the reports, and then generate and send them manually or automatically. SE Ranking has a range of prices based on the number of keywords to track, the frequency of rank tracking and the subscription period. For example, on the Plus Plan, prices range from $511/year ($42.60/month) for weekly tracking to $89/month for daily tracking of 1000 keywords. AWR Cloud is a web-based rank tracking and reporting service, capable of delivering daily, weekly, monthly and on-demand updates. AWR Cloud lets you customize your tracking location down to city level so you can retrieve the same ranking results that your clients from another country or city see in their browsers. It also provides accurate local results, so you know how you’re ranking in specific cities. AWR Cloud automatically retrieves your top competitors so you can see how they compare in the search engine results for your targeted keywords. AWR Cloud has eight different ranking sections to choose from in the dashboard. The default Overview summarizes the keyword ranking activity, e.g., on first place, in Top 10, in Top 50, the ones which Moved up or Down, etc. One of AWR Cloud’s trademarks is the Visibility score and percentage where you can check aggregated data for your main website, next to each of the competitors. With AWR Cloud you can also generate and share quick reports from the dashboard. Once you’ve created your report layouts, you can automatically schedule them to be delivered each week or month in PDF, HTML or CSV format. AWR has a range of subscription plans tailored for Individuals, Small Businesses, Agencies, and Enterprises. Subscription plans are based on the number of keyword ranking units. (A keyword unit means a single keyword checked in a single search engine with a search depth of 5 pages.) You can split your keyword units any way you want for weekly or daily updates, across multiple search engines. If you’re unsure which plan is right for you, then you can take a 30-day free trial or open a free account with AWR branding to explore the core features. SEMrush is an all-in-one marketing tool based on competitor research. 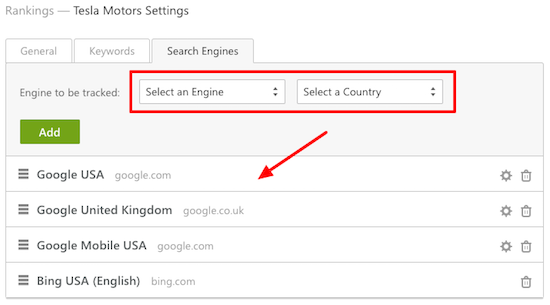 The Position Tracking tool from SEMrush lets you monitor your national, regional, and local search engine positions for any keyword. Data is updated on a daily basis to show your keyword ranking progress. You can also keep track of competitors’ keyword rankings by adding up to ten competitive domains in your tracking campaigns. But with SEMrush you don’t have to know all of your competitors. The Competitors Discovery feature will show you which local competitors are ranking in Google’s top 100 results for your target keywords. The Position Tracking dashboard contains lots of useful information. The default Overview tab shows your domain’s visibility, estimated traffic, and average position for every keyword you’re tracking. You’ll also see any competitors that you’ve added too. The Visibility Trend is a metric based on the average click-through rate and positions of the domain’s ranking pages. You can also switch tabs to display the trends in Estimated Traffic and Average Position. 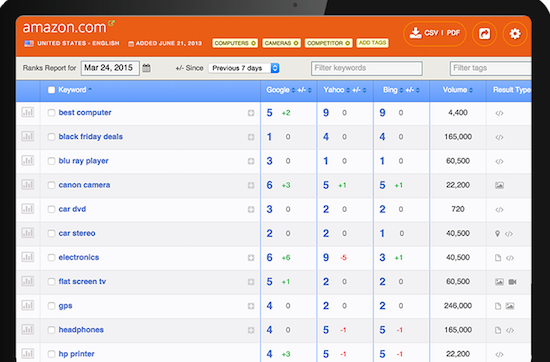 Underneath the charts is the Ranking Overview where you can compare keyword rankings between you and your competitors. There’s a row for every keyword in your campaign and a column for your domain and each competitor. You can see the current rankings and any change in the position notated with an up or down arrow. 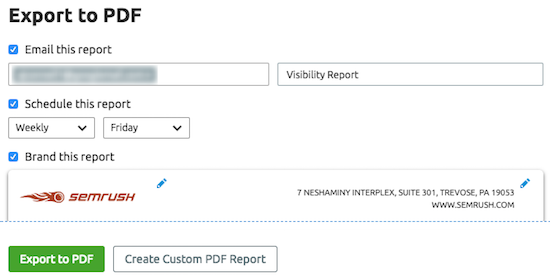 You can generate PDF reports from the dashboard on the Overview, Rankings and Competitors Discovery tabs. Before you export the report, you have the option to email, schedule, or brand the PDF. Branding allows you to add a logo, name and contact information to the report header. SEMrush offers three subscription plans, based on the volume of keywords. 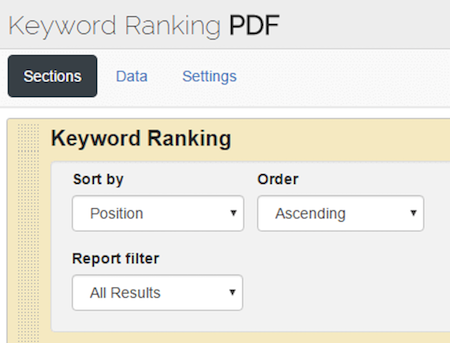 For the Position Tracking tool, it ranges from 500 to 5000 tracked keywords. 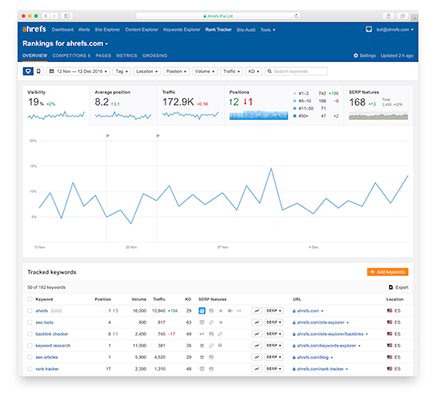 Ahrefs recently added a new Rank Tracker to its growing suite of SEO tools. What started as a backlink analysis tool has now grown into an all-in-one SEO platform. Configuring the Rank Tracker in Ahrefs is straightforward. For each domain, you add your selected keywords. Ahrefs shows a list of keywords you’re already ranking for, which is quite handy, plus you can add your own manually or upload a TXT/CSV file. Next you add your location(s) to track at country, state or city level. Each location has a language assigned, too, like United States (en-US) or United States (es-US). You can also add up to five competitors, and Ahrefs will track their progress for your keywords, too. In the Overview dashboard, you get five different Progress Graphs that look at your overall ranking progress (for all keywords in the project) from five different angles. As you select each mini-graph, the detailed graph displays underneath. You can configure Ahrefs to send a weekly or monthly email notifications report, but aside of that, there are no pre-configured reports that you could send to colleagues or clients. Ahrefs has a range of four subscription plans for its SEO suite. Pricing for the Rank Tracker is based on the volume of tracked keywords, the update frequency, mobile ranking, and locations per website. You can save two months subscription when you opt for annual billing. Before we wrap up this review, let’s not forget the Google Search Console. On the one hand, the Google Search console is not a traditional rank tracking tool. 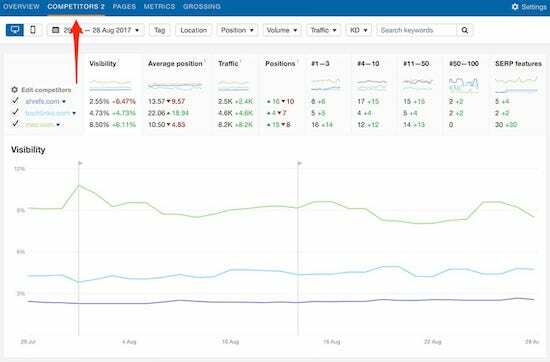 For example, if your rankings dropped across all keywords overnight, you’d expect a rank tracking tool to alert you right away so you could dive in and resolve the issue. But this can’t be done with the Search Console. 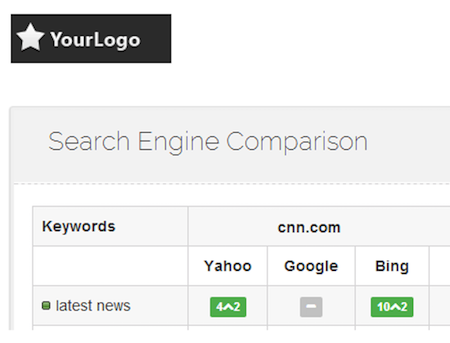 On the other hand, it does provide average rankings, and the report lets you see search data from different angles. While there’s a lot of data available to view in the Search Console, there are no reports as such. However, you can download selected data to a spreadsheet for further analysis. But, on the plus side Google Search Console is completely free to use. Each of the online rank tracking tools reviewed here has its pros and cons. Some are standalone tools, and some are part of a suite of SEO tools, which means the price you pay varies. Some tools are geared towards agencies with their white label reporting, while others are more suited to solopreneurs and small businesses. Take your time and choose the tool that suits your requirements best. Which rank tracking tool is the best fit for you? To help narrow down your selection here are some different scenarios. The Google Search Console is free, but it’s not a real rank tracking tool. You’ll have to dive in and check your data manually. AWR Cloud offers a limited free account. If you’re a startup with a limited budget, there are two stand-out options. SE Ranking offers an affordable low-priced plan that you can tailor to your requirements. Alternatively, ProRankTracker has a wide range of plans so you can upgrade as your business grows. Having your ranking data at your fingertips in an easy-to-read format can save you time. The best three dashboards are SERPWatcher, SEMrush, and Ahrefs. All of them make it easy to see how your keywords are ranking. If you’re running an agency, then you’ll probably want a tool that offers white label reporting so you can customize reports for each client. ProRankTracker, AuthorityLabs, SE Ranking, AWR Cloud, and SEMrush all offer this facility. Sometimes it’s more cost-effective to consider buying an all-in-one SEO platform rather than a separate tool for each activity. If that’s you, then consider SERPWatcher, SE Ranking, SEMrush or Ahrefs, depending on your budget and the number of tools you want.